Notes: Based on the manga "GS Mikami Gokuraku Daisakusen" by Takashi Shiina, published in Shonen Sunday. A company dealing with the occult, led by the penny-pinching redhead entrepreneur, Mikami, goes on all manner of misadventures under the guise of ghost-busting "missions". Along the way, Mikami imperiously tramples all over the rest of the hapless cast. Think Phantom Quest Corp, but instead of your lovable cast of characters, substitute a bunch of Urusei Yatsura and Yu Yu Hakusho rejects, and you get Ghost Sweeper Mikami. Okay, as you can see, we really didn't care for this series. It doesn't help that we had seen Phantom Quest long before stumbling upon GS Mikami, and therefore had some expectations of quality from this show. Mikami, in Japan, had overshadowed PQC by virtue of being a television series rather than an OAV (something that, unfortunately, doomed US-only fan-favorite Phantom Quest from the start), not to mention their similar plotlines. Ghost Sweeper Mikami also predated PQC by a few months, so people assumed they were the same thing (and occasionally still do). And they are very similar, albeit superficially. However, Mikami has serious shortcomings that only highlight why Phantom Quest Corps is so much better. Most of those lie with the main character of the series: Mikami and Ayaka Kisaragi may share red hair and a penchant for the occult, but the similarities end there. Whereas Ayaka, though an incorrigible lush and a spendthrift, is kind-hearted, charming, fun, AND competent; Mikami comes off as brash, backstabbing, and thoroughly unlikable. She forces others to do all the grunt work (for under-grunt pay), only to come in when the monster/demon of the day is weakened, slay the beast, take all the credit, and the money with it. Ayaka may be a procrastinator and a flake about payment of employees, but Mikami is downright mean. Not to mention the really ugly character design, all sharp, straight lines - who thought THAT up?!? 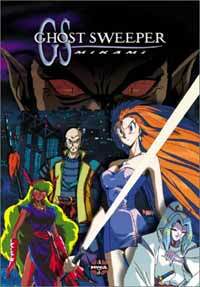 Ghost Sweeper Mikami may have stolen the limelight from its younger sister series back in the early '90s, but not too many fans these days have heard of it, and for a reason. It's actually a pretty mediocre series that, while diverting for maybe a couple episodes, really wears out its welcome fast. The problem, though, is with Mikami herself - she's a spoiled, ugly brat who wants to be heard so badly, she screams and wails, only to find out no one really wants to listen to her after all. If only they'd had a likable main character, maybe this could've been a really good series, but as is, Mikami just doesn't deserve the attention it once had, and it hasn't aged well since, either. For a truly good occult comedy, try Phantom Quest Corps or Haunted Junction instead. Those are light years better than this stale series. Recommended Audience: Well, Yokoshima's a pervert, so situations warranting that are going to have to exist. The occult themes may tick off some parents, but I'd rather take offense at the low level of entertainment to be had from this thing. Nothing too offensive to prevent older children and above from watching this, but it's pretty stupid stuff to subject anyone to.